For a jaded filmgoer like me, discoveries these days are few and far between. However, the cinema of North Korea is truly an undiscovered country. Most cinematic representations of this secretive regime come in the form of documentaries, such as Daniel Gordon’s films The Game of Their Lives and A State of Mind, as well as fictionalized renditions of North Korean characters in such South Korean films as Joint Security Area and Shiri. There have been limited studies in English of North Korean cinema, most notably in Hyangjin Lee’s book Contemporary Korean Cinema. However, North Korean films have very rarely been shown outside their home country. The most recent North Korean film that got some attention was The Schoolgirl’s Diary, which screened at the Cannes Film Festival film market. The Korea Society afforded viewers a rare opportunity to sample this country’s cinema in their film series, “Films From the North,” which featured three North Korean films, two from the 1980’s (Hong Kil Dong, Bellflower) and one from the mid-90’s (My Look in the Distant Future). North Korean films, much like Chinese cinema in the Mao years, were not simply entertainment, but state ideological apparatus meant to promote the glories of both the “Great Leader,” Kim Il-sung, and the “Dear Leader,” Kim’s son and the late leader Kim Jong-il. Also, these films sought to instill proper behavior in the viewer, and provide examples of virtuous, selfless citizens who worked for the country and its people, and forsook selfish personal gain. Kim Jong-il, especially, was and remains the main force behind North Korean cinema. As Columbia University professor Charles Armstrong put it in his opening remarks before the screening of Hong Kil Dong, the first film in the series, Kim Jong-il is in effect the executive producer of every North Korean film, since all aspects of film production are under his very tight control. Kim is also a notoriously extreme cinephile, the owner of a vast collection of films, and also allegedly behind the abduction of South Korean director Shin Sang-ok and his actress wife, Choi Eun-hee. So after having read a little on this cinema, the opportunity to see actual examples was one I couldn’t pass up. Hong Kil Dong turns out to be a rather diverting, if a little creaky, martial-arts action flick surprisingly free of overt ideological content. In fact, with a slight change of costume, this could be a 1960’s or 70’s Shaw Brothers tale, with its stark, literally black-and-white morality play, and the director using his zoom lens like it was going out of style. In fact, it pretty much was out of style by 1986, at least in the rest of the world. Hong Kil Dong was based on a popular folktale that has been adapted over the years for various media in both the North and South. The title character (Ri Yong-ho) grows up with a major strike against him, as far as the mores of the rigidly class-based Confucian society of the Joseon Dynasty was concerned: he was born the illegitimate son of a high-ranking minister and his concubine. Kil Dong’s mother is continually mistreated by the minister’s jealous wife, who tries to eliminate both Kil Dong and his mother by paying a gang of bandits to ambush and kill them. However, they are saved by a kindly wizened martial-arts master who shelters them and takes the young man under his wing, training him to be a fighter. His training is complicated when he saves a minister’s young daughter from the clutches of the same gang of bandits who tried to kill him. He is instantly smitten, but his master sternly warns him against being distracted, and he instead sends her back home. 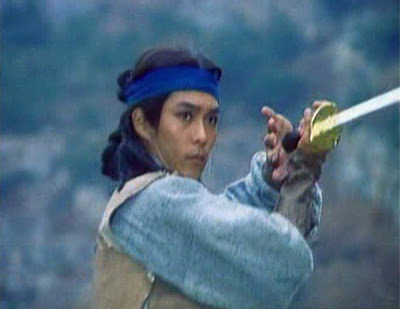 After his training is done, the master sends Kil Dong away, telling him to use his skills in the service of the people. He returns home with his mother, and the minister whose daughter he saved is all in favor of letting them be married, until he learns of his background. Such a breach of class cannot be allowed, no matter what the reason. Thereafter, Kil Dong becomes a North Korean Robin Hood, righting the wrongs done to the people by the corrupt nobility. His enemies are warned of their impending doom by the sound of him playing the flute. When Japanese ninjas invade, he teams with his former enemies and the rest of the citizens to vanquish them. When, after saving the entire country, he is still prevented from marrying the woman he loves, he realizes at long last that there is no place for him in this society, and he gets on a boat with other former citizens to look for a freer place to live. Hong Kil Dong is punctuated by frequent acrobatic fight scenes that, despite the cheesy effects and obvious wirework, are rather impressive considering the conditions under which it was made. The film’s keen sense of outrage at corrupt leadership, and the protagonist’s decision to flee his oppressive society, makes it very tempting to read in this a veiled commentary on what was happening in North Korea as its fortunes were starting to take a very bad turn. However, as Armstrong pointed out in his opening remarks, it is highly unlikely that its audience would have gleaned this meaning from the film, considering how isolated the country was from the rest of the world, and from other systems of thought other than those propounded by the Great Leader. As unremarkable as the film’s plot may be, it nevertheless affords a tantalizing glimpse into a virtually unknown cinema created by an as equally unknown country.